I recently purchased a 10 megapixel Canon 400D camera for home use. This camera cost less than 1/10th the price of my 11 mp 1Ds body and is just 1/3 the weight of the 1Ds. I didnt expect too much of it but it has certainly surprised me with its quality, the ease of use and weight means I take it out with me much more often than if I had to lug the 1Ds. 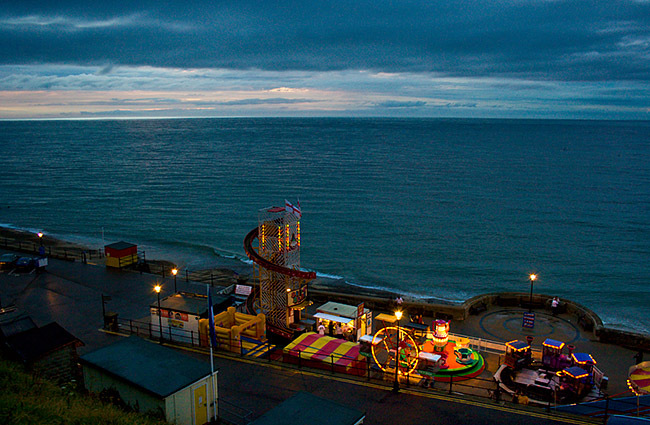 On the way home from the Cromer carnival recently I wanted to capture a shot of the sea and fair in the dim evening light, it meant hand holding at 1600 asa. The resulting image is sharp and detailed. If I had tried to do the same shot with film the quality would have been much worse with a heavy overlay of grain, to acheive the same quality I would have had to use a slow film and tripod with a long exposure, what a pain! I think digital makes photography fun again.